Managing multiple projects is a juggling act; managing multiple projects with intertwined dependencies can be a nightmare. When things get even more complicated, you can tap into Project Server, SharePoint, and Outlook. Follow the links in each step to get detailed information about each process. Example from project management . . . When you link one project to another by creating dependencies between tasks in those projects, you aren't necessarily combining two projects into one. You are making it possible to manage or monitor two separate projects from one location. For example, your main project is the construction of an airplane. Your facility cannot attach the wings (a task in the main project) until another facility builds the wings (an entire project). Other tasks in the other project might also be beyond your control. You can link the “wing building” project to your main project as a task that updates as new information is available. Or you can make “wing building” into a subproject of your master project. The choice depends on whether you simply want updates on the progress of the other project or you need to manage it directly. Merge subprojects into a single master project to monitor how individual projects affect a related group of projects. Making sure stakeholders and team members have up-to-date project data is a key to successfully juggling multiple projects. Find out what other applications you can use to share project information. 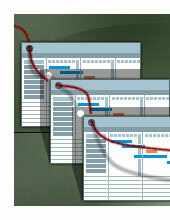 Managing multiple projects may involve reviewing files that were created in an earlier version of Project. You can insert Excel data into Project as a linked object that is updated dynamically when you change the source file. SharePoint can help you share project information without using Project Server. The ultimate tools for project collaboration: Project Server and its companion Project Web App.